Tips/News on Alaska Cruise and Cruisetour: 2019 Canadian Rockies Land Tour Packages! You are here: Home > 2019 Canadian Rockies Land Tour Packages! 2019 Canadian Rockies Land Tour Packages! 2019 ROCKY MOUNTAIN TOUR PACKAGES ON SALE! Choose from one of our three popular Canadian Rockies coach tours. These packages can be added before or after your Alaska Cruise. Depart from Vancouver and drive through the farming communities of the Fraser Valley. Ascend into the Coastal Mountains and follow the Coquihalla Highway to Kamloops, in the arid interior of British Columbia. 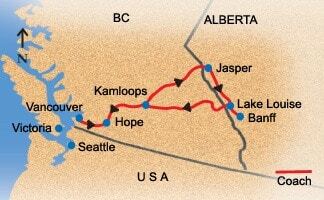 After lunch, retrace the route of the famous Overlanders along the North Thompson River to reach your hotel in Jasper. Overnight in Jasper. Your day starts with a scenic hike through Maligne Canyon before heading South. Then, travel along the world-famous Icefields Parkway to take in some of nature's most spectacular mountain scenery. Have your camera ready for possible wildlife sightings! Highlights include Athabasca Falls, Peyto Lake, and the Columbia Icefield. Ride the Ice Explorer on Athabasca Glacier or visit the Glacier Skywalk (optional activities). Overnight in Banff. Enjoy a full day of sightseeing in Banff National Park. Start your morning with a leisurely hike in Johnston Canyon and stroll along the shores of picturesque Lake Louise and Moraine Lake. In the afternoon, visit the world famous Banff Springs Hotel and Bow Falls. With your free time in Banff, you may also choose from optional activities such as soaking in the natural spa at the Upper Hot Springs or taking a gondola ride to the top of Sulphur Mountain (optional activities). Overnight in Lake Louise. This morning, enjoy a drive through Rogers Pass, the highest part of the route to the Rockies. On your scenic return journey through Yoho National Park, catch a glimpse of an engineering marvel: the Spiral Tunnels. Arrive in downtown Vancouver in the evening. Your day starts with a scenic hike through Maligne Canyon before heading South. Then, travel along the world-famous Icefields Parkway to take in some of nature’s most spectacular mountain scenery. Have your camera ready for possible wildlife sightings! 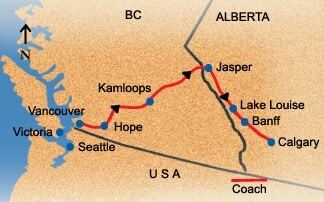 Highlights include Athabasca Falls, Peyto Lake, and the Columbia Icefield. Ride the Ice Explorer on Athabasca Glacier or visit the Glacier Skywalk (optional activities). Overnight in Banff. 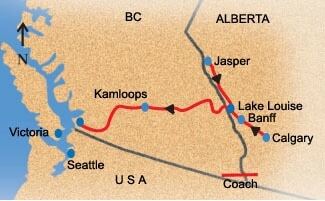 Coach transfer from downtown hotels or airport to Jasper. Travel through the rolling foothills of Alberta into the majestic Canadian Rockies. En-route, take the Icefields Parkway, 'one of the most beautiful highways in the world'. Overnight in Jasper. *All pricing above is in US Dollars, per person. Taxes are additional. Pricing is based on two people sharing and subject to availability. The "From" prices listed on our website is for tour package with standard hotels; for premium hotel rates please inquire. All pricing is based on availability and subject to change by the cruise line at any time. For more information please contact one of our Alaska Specialists! Speak with an Alaska Specialist for more information #1-800-738-8837 or +1-604-738-8837.